So, yeah, my keeping track of what I've been reading hasn't been kept up to date. Not that I haven't been making the notes, but last couple of months have been hectic. So I've not followed those notes by posting the details. Going to make up for that now as we start June and I start a new list. At same time, it feels like after a surge of reading at start of year I've not been doing as many short stories in the last two months. Which may just be an impression, rather than a reality. Certainly I've been doing more reading of novels, novellas and graphic novels in last while - so there is a balance to be had. Though, part of the short story spike comes from listening to podcasts - so that is a different time use. But then, I have been catching up on Ars Paradoxica, The Bright Sessions, Rabbits and the new series of Alice Isn't Dead. Oh, and of course the finale of the wonderful The Scottish Podcast. [ ] Sophokles in his Cave - Brendan C Byrne @! Another month of short story reading, feels as though on some level I'm deliberately reading more shorts because I'm tracking what I'm reading. But I always do go through phases - I've been picking at a couple of year's best anthologies, and not necessarily most recent editions thereof. And been listening to more fiction podcasts. Ideally I would provide links and comments each month to provide context and back to what this list is. This month I've managed to link to the story, or author/book story was from. I had intended to go back and do last month's list and report with this list, but it is time consuming to put all this together. Lot of good stories, a lot of fine stories, some average. Which is why it would be nice to share more opinion/response - though as always YMMV and tastes are individual. The most I've managed is to mark the stories I particularly enjoyed and particularly recommend reading with a "@" and as with last month where a story just didn't click with me to the point I gave up reading it I've marked "(x)". I have had the intent of keeping track of what short fiction I read for a while, the last time I tried I failed quickly. Ideally I'd add commentary and links, particularly as some of these pieces were very good and should absolutely be read. That'll maybe follow. For the moment I'm sharing to at least get a ball rolling. * - indicates previously read. (x) - indicates unfinished because it didn't engage. Some of these were read in text form, some listened to as podcasts, but I'm not differentiating for purposes of list. My next work in progress? I love weird twitter, the unpredictable, the absurd, the way that so many single tweets can feel like stories I want to read/write. My story The Witch At The End Of The World (currently available in Thirty Years Of Rain), like so much of what I write is influenced by music. In this case the characters sing as they travel. Suicide's "Ghost Rider" is one of the tracks they sing, it felt right, the idea of these riders traveling through the land of the dead. The living haunt the dead lands, the end of the world. During the writing and editing process of this story Alan Vega of Suicide died, so this started to feel like some small tribute. I also link here to The Young Gods cover of the same song, another version that was going through my head, electronic stripped to acoustic, in turn in my story stripped to a cappella. Well, tonight is the big night. The Glasgow launch of Thirty Years Of Rain, the 30th anniversary collection of work by members of the Glasgow Science Fiction Writer's Circle. A cross genre collection of stories and poems, old and new. Inevitably, as with all GSFWC events, we will end up in the pub. Hopefully see people there. On Writing "The Witch At The End Of The World"
Writing can be difficult. Many writers will tell you so. And there are so many ways to self-defeat, block and distract. For me I got so bogged down in a loop of submissions and rejections, token editing to try and add polish upon polish to things I had already written, that to write something new started to feel impossible. 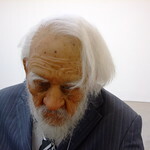 With “The Witch At The End Of The World”, or “Papa Okid In And The Witch At The End Of The World” as it was originally called I was trying to break that cycle. I decided to write something different, something that would be easy, that would brush away cobwebs and give me a revived compulsion to write. And it did… eventually. I was going for a fantasy story. Something epic. Compared to my usual near future pseudo-science fiction mixing dalliances with horror. Though more Moorcock or Harrison, was how I saw it. It was an end of the world story – something evil, a group gathered to defeat evil. You know the deal, how it works. The Magnificent Seven, with witches, and a great big alien spider queen witch. Ride into the occupied city, Paris I decided, and fight monsters, defeat the big bad. Yay. Except my characters decided they absolutely had to ride to this magic tree before they went riding into a snow bound alien tainted Paris. Then they decided that the city thing and the alien witch thing bored them, they’d rather sing and sit around and drink strange tea. So that is what happened. Kind of. The original themes are still there. A group gathering to ride against evil; ideas of the end of the world, of fallen civilisations, the Anthropocene and how fucked we all are. This is dark stuff, except, hopefully, it doesn’t entirely feel that way. One of the hard things, one of the reasons the story took so long to write, was finding the voice. Initially I had envisaged this guide bloke, someone desperate enough to go to a difficult place and ask for help – Papa Okid In, or Papa Oki Din as he became. But his voice didn’t work for me. I rewrote the opening scene an infinite number of times, I know, I counted them. Each a variation, on a turn of phrase, on a first step, on finding that damn voice that made the damn story talk. Then I found it, and I won’t say from there that it wrote itself, but oh Iggy, it became so much easier. I am a member of the GSFWC (The Glasgow Science Fiction Writer’s Circle), a support group of writers. Offering critiques and advice and support to each other. The GSFWC has now been going for 30 years, to celebrate that they have put together an anthology – Thirty Years Of Rain. I decided this story would be my submission, I decided this anthology would be my impetus for finishing the thing that I had been fighting with on and off for a year. Thanks to the patience and support of the anthology editors, the final version of The Witch At The End Of The World has been included in Thirty Years of Rain – which will have a launch night in Glasgow's Sauchiehall Street Waterstones, on the 30th of September, from 7pm. I'll be there, along with a number of the other authors included, hope to see some of you there too. 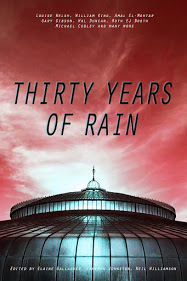 THIRTY YEARS OF RAIN - CELEBRATING THIRTY YEARS OF THE GLASGOW SCIENCE FICTION WRITER'S CIRCLE. September will see the publication of Thirty Years Of Rain a collection of short stories and poems by writers who have at some point over the last 30 years been members of the GSFWC. The collection includes my own story The Witch At The End Of The World. A cheerful, uplifting story about the end of world. A bit of a departure from what I normally write, this is the closest I have done to being an Epic Fantasy. Except, because it is me, it isn't really that at all. Instead it is something.... odder? There will be a couple of launches for the anthology, the 1st at the annual British Fantasy Con, the 2nd at Glasgow's Sauchiehall Street branch of Waterstones on the 30th of September from 7pm. I will be one of the authors at the Waterstones launch, where there will be readings and signings. I was struck last night by an increasing occurrence. Where you see an amusing little nugget on twitter and you smile in an appropriate manner. Then a day, or two, later, you see the same thing again. And again. Then you see that same little nugget being picked up by both Boing Boing and Jezebel, and being passed off as a cutting edge moment. I’m not ahead of the curve. My finger is not in the pulse. So what does this say about “news” sites passing on information that is days old? On one hand, it has always been the case. But on the other, it probably speaks to an idea of saturation, particularly on twitter. Where the medium becomes so utterly saturated and repetitive that it becomes harder to see something for the first time, instead of seeing that thing again. Another tweet I saw last night, from the magazine Huck, about a film being shown in Manchester about the erosion of culture in New York, and the people fighting back against it. Like many things, I didn’t look beyond that one tweet, so I don’t have any details on that particular node. But it is one dot in a persistent pattern – culture in New York is dead, or replace that with London, or replace that with. And wave a hand towards gentrification. Which flags another dot in my head, from reading an article the other night in an actual physical copy of Huck magazine which I have lying around. Which was a guide to Wellington in New Zealand, how it was a cultural hot spot, the starting point for many a visitor setting out on adventure. How that has transformed over the years due gentrification. Which in turns reminds me of a video I watched on YouTube, a group of artists talking about how much more difficult culture was becoming in Reykjavik for the same reason. I've been reading the new edition of England’s Hidden Reverse that was released recently. An updated version of the book that came out 10 or so years ago? My memory should be better on that, given I was at the launch of the version when the author spoke about it in Glasgow’s Monorail records. Anyway, book and reading, in particular the section I was reading last night was wallowing in the London scene of the 80’s – post-punk/industrial music, pretentious art wankers and confrontational bastards. All living, as the saying goes, cheek by jowl, in squats. All playing dingy little venues, where violence would erupt, partly in protest and partly because folk were arseholes. Which ties into that idea of that film mentioned above – a lost New York to a lost London to a lost cultural past. Anyway, this isn’t supposed to be some essay, just a note, observing a couple of things that catch the eye. By contrast, I was listening to a podcast on the drive to work this morning. I tend to vary depending on mood – a selection of music played at random or a podcast. Today I picked a conversation with Clive James, and I was struck (perhaps again, perhaps more lucidly) by why I enjoy certain podcasts. Listening to two men talk about books that I will never read and likely would not enjoy if I tried to read. Or on other occasions two people talk about music I’d never listen to. It is the listening to the enthusiasm and pleasure expressed by other people. Where you can appreciate where people are coming from, you can enjoy the intelligence and engagement. Occasionally there is that nugget in there, where you think actually that is something I should read, listen to, watch, appreciate and you make a discovery. I am undoubtedly a fan of discovery, of expanding my horizons. Though, lets not get carried away, last week I stumbled upon the worst podcast ever. An episode of a show that I listen to periodically had hit on the perfect formula – five people sitting around and talking in the most academic terms about the nature of something only really of interest to the five people talking about it. I lasted 10 minutes, I was driving, before I started swearing and was forced to change to something resembling interesting. Though, of course, I’ll do my best to adhere to the idea of mentioning things I like while politely not naming things I am criticising. Though, I can have mixed feelings about that, particularly when everyone else is wrong. But I am only human.